A vital step in establishing our company was creating a memorable title sequence for the GooRoo Animation logo. With Animal Instincts being selected in film festivals all over the world, we needed something to put at the front of the film to get our name out there. We had gone by the name Guru Animation in the past, basing the name on the main character from our 2002 film Cows With Guns. 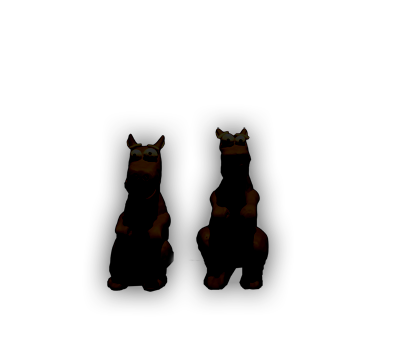 In 2007, while making Animal Instincts, we realised there was another animation company out there with a similar name so we decided to make the change to GooRoo. It made perfect sence...we basically work with goo (plasticene) and we could use the kangaroos from our 2005 film The Bushman of Bunyip Billabong as our mascots. The idea for the intro all came together then but we had to finish Animal Instincts before getting a chance to shoot it. We actually melted the plasticene in the shot with a intensely hot light, quickly trying to take every frame of the sequence before the melted too much. It was the most uncontrollable and unpredictable animation we've ever done, but turned out nicely in the end. To see the full intro, click here and watch Animal Instincts.